I haven't quite reached the stage of publishing so promoting my work is still a bit of a pipe dream. Nonetheless, this book is written in an easy to read style and is filled with useful information I look forward to being able to use. 4.0 out of 5 starsJust what I needed. It just proves that the little things, some of which are free or as little cost as this book is, are the best things. Just tipping my toes into fiction writing and find I am actually drowning, not from the writing itself, but all the backend work involved to get myself read. Naturally my best friends will buy, read and rave over my virgin work but how do I get it a stranger to buy one? These tips are from her personal experience but can be utilized by folks like me. I know several people who have had numerous books published by Kindle, some do well, some flounder. Amazon/Createspace publishes them for free but leaves the author adrift in a sea of big names houses with their PR machines. What to do? I want my books read but I have only a bit of computer savvy and no marketing experience. This guide is the best thing on Kindle I have seen! Clear, concise and achieveable. If you are seriously comtemplating publishing an ebook after putting your heart and soul into it then do NOT hesitate purchasing it. Good luck novices! Ms. Seaton shares her proven tips to promote your books. Most of the advice are things that just make sense. If you have been writing for a while, this book doesn't offer you anything new, although for newbies, it's a must. She gives detailed information on blogs, websites and social media. I loved how she talked about her time that she spent as a writer on the promotions each day. Being a writer is about writing first but also being a person out connecting with your readers. My favorite advice was about keeping writing. That is the clue to being successful. More you write, the better you get and the more people follow. Promotional Tips and Tricks for Aspiring Authors in the Digital Landscape is the perfect for Aspiring Authors, trying to succeed authors and just anyone else that cannot figure out why their book isn't selling. Written in the Annie Seaton style, the 'friends meeting over coffee to talk style', is so helpful with detailed information on how to promote yourself and your book(s)using social media and creating a 'Brand Name'. Before her book, I was clueless. 'If you write it, they will come', is not necessarily true unless others know that you have a book on offer, where they can buy it and what its about. Once they find you, the readers want to know what next in the series or what you're working on. Just having a website is not enough. Ms. Seaton details not only why you need Facebook, Twitter, a website, etc. she details how to set them up and gives suggestions for those on a budget. She even has suggestions on how often you need to update your information on these sites as well! The other important detail that I received from this wonderful book, was the recognition that authors like, say, ME, work alone and quietly, thinking we're the only ones out here working in the virtual world, struggling to write, to create a story that others will enjoy. 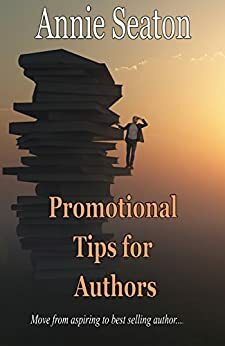 She recommends a couple of ways of connecting with other authors that don't sound embarrassing, cheesy or gut-wrenching to implement. I give this a solid and heartfelt 'five stars' and recommend PPTFAAITDL to anyone that has ever put pen to paper, fingers to keyboard in the hopes of selling their book or stories. I took twelve pages of notes and have been doing my research over this last week to better understand how others do it. Wish me luck, as I attempt to set up my Business Facebook account today. But even as I write this, I see another thing that I need to update pronto. If I'm a brand, then why am I not promoting myself as I offer my reviews? I read this book in a single sitting and picked up heaps of great tips. Also realized why some things I was doing weren't working. Many thanks, Annie, for sharing your expertise. This is a quick and enjoyable review of the various ways an author (new or established) can get their brand started and help it flourish.